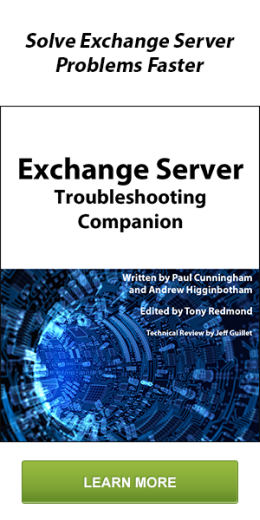 I was working with a customer who had Exchange 2010 & were in the process of migrating to Exchange 2013. As part of their migration process they pointed their Exchange 2010 Outlook Anywhere namespace (let’s call it mail.contoso.com) to Exchange 2013 in DNS. At this point all of their Outlook Anywhere clients should have been connecting to Exchange 2013 & then been proxied to Exchange 2010. While this was somewhat working, they also immediately noticed users were randomly being prompted for credentials, resulting in a negative user experience. Sometimes the prompts would be when connecting to Public Folders while other times mail or directory connections from Outlook to Exchange. When I was approached with this issue/symptom it sounded familiar. After a search through my OneNote I realized I previously had a discussion with some people I know from Microsoft Support regarding this issue. Turns out this issue was recently addressed via http://support2.microsoft.com/kb/2990117 “Outlook Anywhere users prompted for credentials when they try to connect to Exchange Server 2013”. This is actually an IIS issue with Server 2008 R2 (the operating system Exchange 2010 was installed on) that’s resolved by a hotfix. After installing the hotfix & rebooting the issue was resolved & their users no longer received the prompts. I originally discovered this issue back in early Feb & let a couple people on the Exchange Product Team know about it via the TAP but it seems to be affecting more customers than initially thought so I thought I’d share. Why it ever looked to https://company.com/autodiscover/autodiscover.xml I’ll never really know because honestly I’ve never come across a customer who had it deployed that way; most have https://autodiscover.company.com/autodiscover/autodiscover.xml but I imagine when Exchange 2007 was first being developed they weren’t exactly sure how customers would be implementing AutoDiscover. The above methods have served us well since Exchange 2007 timeframe but for some reason the Outlook team decided to try & implement some giddyup into Outlook & try to speed up the process. They decided to have domain-joined Outlook 2013 clients query both the SCP values in AD as well as the DNS records at the same time. If an SCP record was found it would still be used but in the event it failed then it would already have the DNS response ready to go. Great idea, however there’s one problem in the implementation. 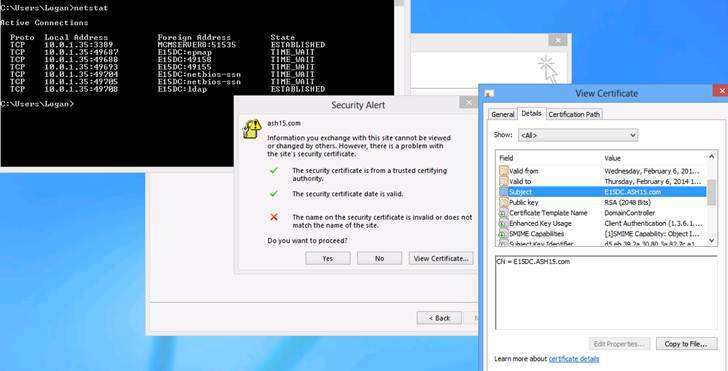 If Outlook 2013 encounters any kind of Certificate error while doing the simultaneous DNS query then you will receive a pop-up in Outlook about the cert. That’s right, I actually get a certificate pop-up for my lab’s domain name (ash15.com) & not autodiscover.ash15.com like one would expect if I were to have a certificate issue on Exchange. When Outlook 2013 does it’s simultaneous DNS AutoDiscover query the first URL it tries is https://company.com/autodiscover/autodiscover.xml, which in my lab environment resolved to my Domain Controller, which was also serving DNS, as well as a Certificate Authority. Ash15.com resolved to this server because it’s my internal Active Directory domain name & the name server entry resolves to my DC (just ping internaldomainname.local in your AD lab environment & you’ll see the same thing). Now because I have web enrollment enabled & am listening on 443 in IIS the server responded. Also, because I did not have a cert installed on the server with ash15.com in the Subject or Subject Alternative Name then it gave the certificate error we see above. The error is easy enough to get through & it only occurred on initial profile creation but this can definitely prove painful for some customers. Obviously my lab environment is a corner case but there have been several other customers report this issue with Outlook 2013 as well. Imagine you have a public website for andrewswidgets.com hosted by a third-party hosting site & you did not pay for HTTPS/443 services. However if you were to query the website using https then it could respond & obviously not return a certificate with andrewswidgets.com on it (because you haven’t paid for it you cheapskate…). Now imagine you begin deploying users using Outlook 2013 in your internal environment. In the past, they would have found the SCP record that would have pointed them to your internal Exchange 07/10/13 server for AutoDiscover & would have been happy as a clam (one Exchange Product Manager’s favorite way to describe Exchange bliss). However, now they may get a certificate pop-up for andrewswidgets.com when creating a new profile. There are a couple ways around this. Make sure andrewswidgets.com doesn’t listen on 443, or possibly get a proper cert on your website that is listening on 443. Simply put, just make sure whatever andrewswidgets.com resolves to is something that’s not going to throw a certificate error. I’ve heard nothing concrete or public but the Outlook team is aware of the issue & listening to customer feedback. I suggest contacting Microsoft Support if your organization is running into this issue.